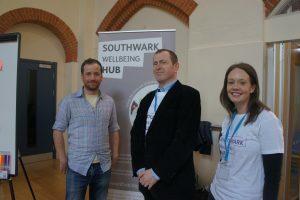 Residents of Southwark were given the opportunity to discover the free local support available to improve their wellbeing, at a Wellbeing Fair held during Mental Health Awareness Week in Walworth on Saturday (21 May). Hosted by Together’s Southwark Wellbeing Hub, the fair gave people the chance to speak to 15 local Southwark organisations, including Healthwatch Southwark, Age UK Lewisham and Southwark and SLaM Recovery College. People also took part in a range of free activities, hosted by Connect and Discover at Morley College, CoolTan Arts and Creative Crafts, including: how to make summer bunting, putting together a plant window box or hanging basket and jewellery making. The aim of the event, held at Pembroke House, was for people to meet local wellbeing services, discover new activities and groups, and try some free workshops. Together’s Southwark Wellbeing Hub is a free local service available to all Southwark residents. The service offers support to help people to find, choose and receive support if they are worried about their wellbeing. The Hub also offers practical support and information, and a programme of activities to help people manage their wellbeing. Leon White, Project Manager at the Southwark Wellbeing Hub, said: “When people feel down or stressed they might not know where to go to get support. People may often also be experiencing issues with their housing or money and need practical support to manage this. The Hub has just celebrated its first birthday and during this time we have supported many people to find, choose and receive the support that they need. The Southwark Wellbeing Hub is open throughout the week and you can drop in or staff can meet you at a convenient location. To contact The Hub, call: 0203751 9684, email: southwarkhub@together-uk.org or visit southwarkhub.together-uk.org. The following organisations attended the event: Healthwatch Southwark, Age UK Lewisham and Southwark, Southwark Carers, SLaM Recovery College, NHS Complaints Advocacy, Pembroke House, Community Southwark, Wheels for Wellbeing, Talking Therapies Southwark, Connect and Discover at Morley College, CoolTan Arts, Creative Crafts, Telefono de la Esperanza UK and Advising London. For further information please contact the Communications Team on 0207 7807 316.